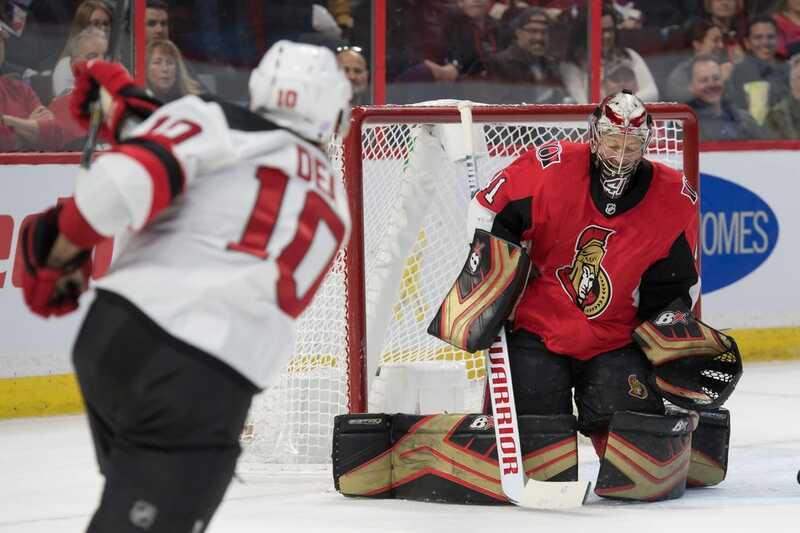 Mark Stone and Colin White scored twice apiece Tuesday night for the Ottawa Senators, who scored six unanswered goals on their way to a 7-3 win over the visiting New Jersey Devils. Their second win in the last eight games came at an opportune time for the Senators, who were embroiled in controversy Monday when a video was leaked of several players mocking the coaching staff during an Uber ride in Arizona last week. Thomas Chabot and Ryan Dzingel opened and closed the six-goal outburst for the Senators while Magnus Paajarvi added an empty-netter late in the third period. Goalie Craig Anderson earned the win by recording 30 saves before he exited late in the third due to an injury. Mike McKenna stopped all six shots he faced in relief. Taylor Hall and Kyle Palmieri gave the Devils an early 2-0 lead and Travis Zajac scored in the third for New Jersey, which has lost four of five on a seven-game road trip and is 2-6-1 since opening the season 4-0-0. Starting goalie Cory Schneider allowed four goals on 22 shots before being pulled for Keith Kinkaid, who stopped 17 of 19 shots. The Devils scored the game's first two goals in a span of eight minutes in the first period. An end-to-end rush by the Devils ended in nifty fashion when Hall took a drop pass from Nico Hischier and shuffled the puck before he fired a shot between Christian Jaros, who had fallen to one knee, and Chris Wideman and past Anderson at 3:14. Palmieri doubled the lead with 8:40 remaining, when he corralled the rebound of a slap shot by Ben Lovejoy and backhanded the puck into the net. But it took the Senators just 98 seconds to tie the score. Chabot cut the gap in half after he shook Hischier and fired a shot off the glove of Schneider with 8:55 left. Fifty-three seconds later, Matt Duchene backhanded a pass around the Devils net to Stone, who tucked his shot between the legs of Schneider for his 100th career goal. White gave the Senators the lead for good 2:27 into the second, when he took a cross-crease pass from Stone and beat Schneider from point-blank range. Stone scored what proved to be the winning goal thanks to another setup from Duchene, who took a pass from Chabot at center ice and skated into the Devils' zone and. Duchene was about to be double-teamed by Sami Vatanen and Damon Severson when he passed to Stone, whose shot flew over Schneider's stick hand. That chased Schneider, but the Senators still extended their lead to 5-2 against Kinkaid thanks to a fluke goal by White. A pass near the Devils' net by Stone glanced off the face of Vatanen, ticked off the skate of White and trickled past Kinkaid. The Senators scored their sixth straight goal when Dzingel tallied at the 10:11 mark. The Devils pulled within 6-3 when Zajac scored 4:02 later, but they could get no closer despite pulling Kinkaid with 4:53 remaining. Paajarvi scored an empty-netter with 1:59 left.